This highly detailed, serious scientific work proffers an ambitious proposal aimed at solving the strain on the world’s resources due to rapidly increasing population. 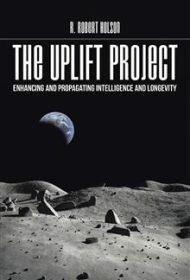 The idea of the Uplift Project (UP) is to address pressing issues of resource depletion, overpopulation and perhaps even extinction by creating an association of humans devoted to developing greater intelligence and longevity in our own species, in related animal species and in machines. The author’s plan, involving 40 generations over 1,000 years, would be to produce highly intelligent, long-lived offspring through genetic manipulation and environmental influences — the idea being that these super-smart, long-lived beings would have the best chance of finding solutions to existential problems before it’s too late. Overall, the book is smoothly written and intelligent. The passionate author covers every angle; for example, how to convince people to produce offspring with total strangers, since ideally genetically matched intellects would be asked to reproduce. He also discusses: how to attract and keep membership in the UP through the years; high operating costs and how to pay for them; and how to deal with potential issues such as people’s fear of eugenics, infighting, abuse of power and loss of interest. While Holson admits this is a “near-utopian dream” ideally meant to spread these intellects across the planet and into space colonization, he believes it an imperative before water, food and other resources are depleted. The book’s audience likely will be scientists interested in a unique solution to the world’s pressing problems.